Did you realize that Georgia’s official state symbol, the peach, is not native to the state, and was originally introduced by Spanish missionaries beginning more than a century before Georgia’s founder was even born? And did you know that one of Georgia’s most delicious culinary specialties–pork barbecue–also descends directly from the Spanish period? Pigs were first brought to Georgia by Spanish explorers and missionaries as early as the 1500s, and the word “barbecue” was originally adopted by the English from the Spanish word “barbacoa,” referring to the framework or grill upon which the meat was cooked. In fact, this Spanish word was itself originally adopted by early Spanish settlers from Arawak Indians in the Caribbean. Georgia’s colonial history cannot be separated from its Spanish roots, and by the same token some 98% of Georgia’s human history occurred before Europeans ever arrived in North America. It is for these reasons that I have assembled this page. The initial centerpiece for this page was the revised text of an article I originally wrote in 1993 (published in the Fernbank Quarterly and later in Georgia Journal magazine), now called “Before Creek and Cherokee: The Colonial Transformation of Prehistoric Georgia.”Over the years, I have referred many people to the printed versions of this article, since it provides readers with a comprehensive summary of the early colonial period, focusing on its impact on Georgia’s indigenous chiefdoms. It also includes a list of easily-available books at the end of the article for readers wishing to explore the subject in greater depth. Since I have found it to be a useful educational tool about one of Georgia’s least well-known eras, I encourage readers to download and read it. All I ask is that its entire text, bibliography, and authorship remain together if it is printed out. The topical links below will take readers to individual resource pages which contain a combination of summary text, data tables, chronologies, and graphics. A comprehensive set of links to related web pages is provided on a separate page. 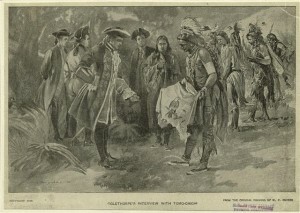 The “Georgia Before Oglethorpe” page will undoubtedly present historical events and activities that are at the very least uncomfortable, and perhaps even offensive, to the descendants of those involved. 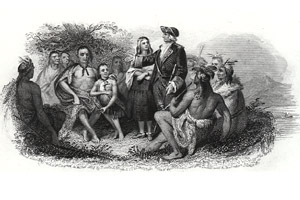 It may be somewhat disagreeable to realize that English traders from the Virginia and Carolina colonies routinely bought, branded, and sold young Indian slaves (including practicing Christians from virtually unarmed mission communities), or that the late 17th- and early 18th-century ancestors of the Creek and Cherokee (among many other indigenous groups) were willing participants in the English slave trade, raiding and capturing other Indians for sale to the traders, or that Hernando de Soto’s army forcibly gathered food, burden-bearers, and women from many of the villages they encountered, and occasionally threw Indian guides to their dogs to be eaten alive. The image of ancestral Creek Indians from the middle Ocmulgee River carrying the severed head of Fray Juan de Parga to an Apalachee council house during a massive 1704 English raid against the Apalachee mission province, all under the personal direction of South Carolina Governor James Moore, is not a pleasant one, but such was the character of the era. There were few heroes, but by the same token there also were few villains as judged by 16th-, 17th-, and 18h-century standards. The characters of history were products of their culture and their era, and to judge them by modern standards is, I believe, an injustice. The events of history cannot be taken out of their context. While it is possible to debate the details of historical events, or the motivations and reasons for individal actions, it is an injustice both to historical actors and to history in general to judge these individuals or events, or to gloss over the more unpleasant side of history simply for the sake of modern sensibilities. For this reason I will apologize in advance to those who find some of the history of early colonial Georgia to be uncomfortable or offensive. 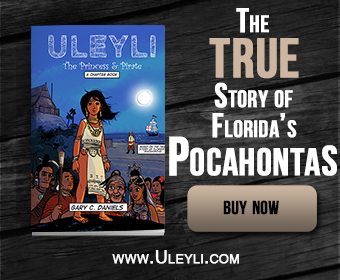 Nevertheless, unless there is clear and convincing evidence to the contrary, these events will remain posted here as a documented part of Georgia’s early colonial era.